Record-Setting Sale Of An Ancient Assyrian Stone Relief Sparks Looting Fears In Iraq The 3,000-year-old relief fetched more than $28 million at Christie's, more than any other similar work. But some archaeologists worry the high price could trigger looting of other ancient artifacts. Assyrian artifacts are displayed at Iraq's National Museum in Baghdad in 2016. The $30 million sale of a 3,000-year-old Assyrian relief is sparking concern that similar artifacts will be looted. A bidding war at Christie's this week sent the price of a 3,000-year-old stone relief from $7 million to more than $28 million, setting a world record for ancient Assyrian artworks and raising fears among some archaeologists that soaring prices will fuel the market for looted antiquities as well as legally acquired ones. The 7-foot bas-relief from the palace of Nimrud in present-day Iraq was acquired in the 19th century, long before there were laws prohibiting the wholesale removal and export of archaeological treasures. Christie's described it as "the finest example of Assyrian art to have come onto the market in decades." ⭕ A rare, 3,000-year-old sculpture sold for $31 million at Christie's New York Wednesday, shattering the previous world record for Assyrian art. The sculpture tripled its pre-sale estimate of $10 million, and the buyer remains anonymous. The price was thought to have reached as high as it did partly because the piece — brought to Virginia in 1860 and one of the earliest known pieces of ancient art imported to the U.S. — has a clear provenance. The gypsum slab, depicting a protective deity, is one of hundreds of reliefs that were removed from the palace of Nimrud near Mosul in the 1800s. These are now spread around museums and institutions from Kansas City, Mo., to Kyoto. But only a few pieces from Nimrud are on display in Iraqi museums — and what was left of the site was smashed and looted by ISIS after it occupied northern Iraq four years ago. A picture from November 2016 shows a relief at the archaeological site of Nimrud a few days after Iraqi forces retook the ancient city from ISIS. 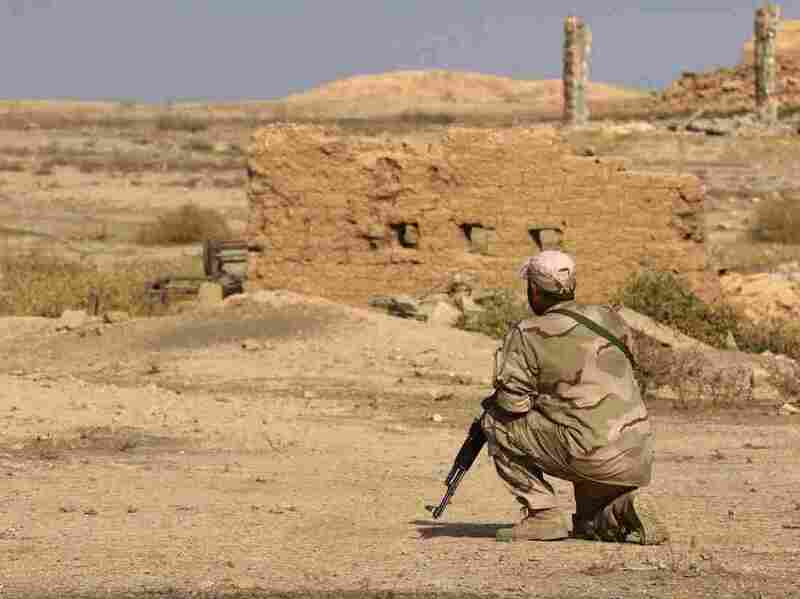 ISIS destroyed pre-Islamic sites as idolatrous but is also believed to have smuggled out pieces for sale on the black market to fund its operations. This week's multi-million-dollar Christie's sale, some experts warn, may lead to more instances of looting. "This is going to spark a whole bunch of new looting because the prices of antiquities will go up," says McGuire Gibson, professor of Mesopotamian archaeology at the University of Chicago. "Besides the stuff that was destroyed in Nimrud, I'm sure parts of it were taken out and are on the international market ... 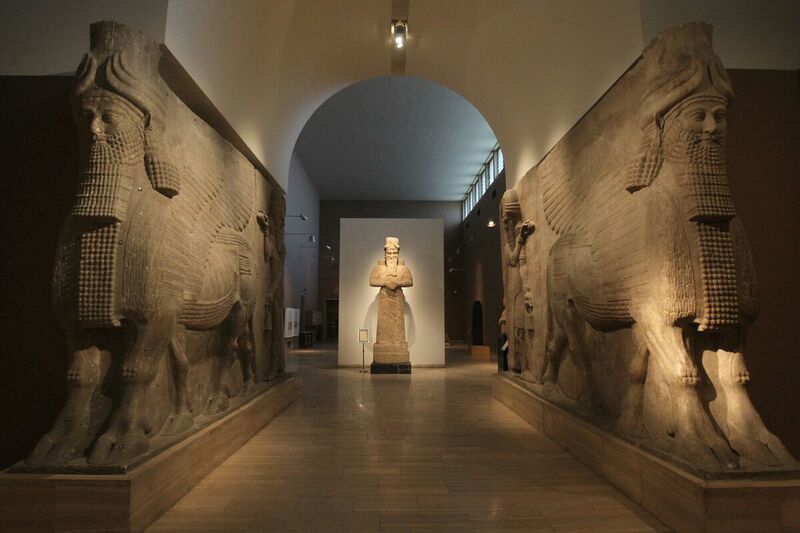 It's going to make the price of all Mesopotamian antiquities go up." Gibson says fragments of other Assyrian palaces, along with cuneiform tablets and cylinder seals, have increasingly been showing up on the market with fake documents showing the country of origin. "There have been bits and pieces of broken reliefs that have been stolen out of these places over the last 10 years," he says. As the auction unfolded at Christie's in New York on Tuesday, two potential buyers placed bids by phone, bidding against two others in the auction room and a preexisting bid on the books. Bids started at about $7 million, and over the next five minutes increased until they reached more than $28 million, bid by one of those in the room on behalf of an anonymous buyer. The buyer's premium paid to Christie's boosted the total price to almost $31 million. The relief's seller was the Virginia Theological Seminary, an Episcopalian seminary that was given three Nimrud reliefs in 1860 by Dr. Henri Byron Haskell, an American missionary. The unusually well-preserved relief depicts a winged genie or minor deity known as an apkallu. He has daggers tucked into his tunic and holds a small bucket in one hand and a cone-shaped object in the other, signifying fertility and protection for the king. 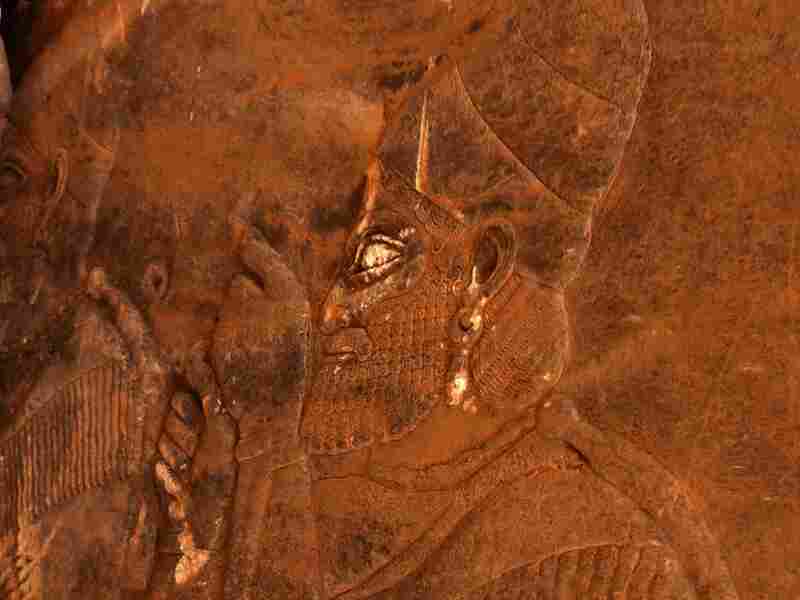 The Assyrian King Ashurnasirpal II reigned in the late 9th century B.C. The palace he built at Nimrud was one of the largest in antiquity, reflecting his conquests of much of the ancient Near East. A cuneiform inscription on the relief calls him a fierce monarch and merciless hero — a "king of kings." The Iraqi government had earlier appealed to Christie's to stop the sale, arguing the relief was part of the heritage and patrimony of the Iraqi people. An Iraqi soldier looks at destruction caused by ISIS at the archaeological site of Nimrud in November 2016, a few days after Iraqi forces retook the ancient city. "It's a matter of principle, similar to the Elgin Marbles," Fareed Yasseen, Iraq's ambassador to the United States, tells NPR. The Elgin Marbles are marble sculptures that stood in the Acropolis of Athens in ancient Greece. They were removed and shipped to Britain in the early 1800s, while Greece was part of the Ottoman Empire. Christie's international head of antiquities G. Max Bernheimer told NPR by email that the auction house had "completely" responded to Iraq's request to stop the sale with documentation that the piece had been legally imported. 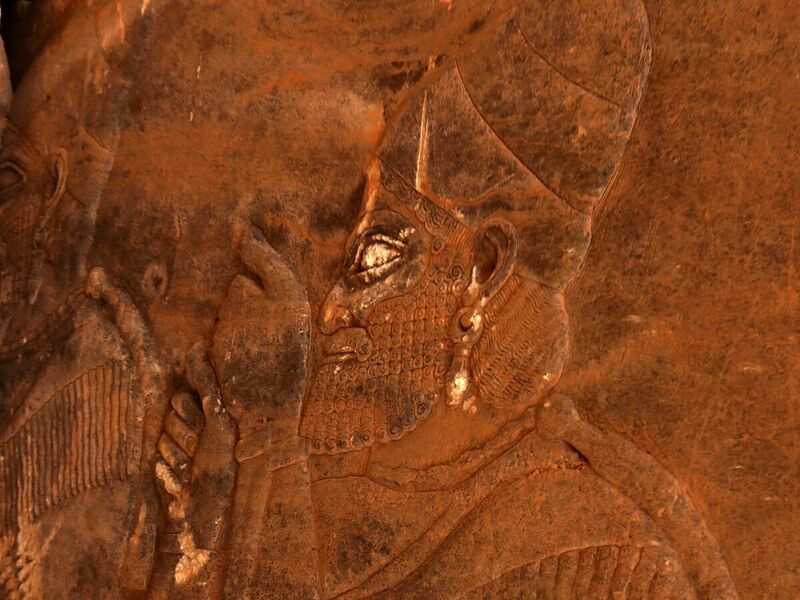 The Virginia seminary said it made "the difficult decision" to sell one of its three Nimrud reliefs after realizing last year it could not afford the insurance premiums for all of them. "Now that the relief has been featured at Christie's, people think of it primarily as an art object, but for Virginia Theological Seminary the panels have always been considered scholarly resources," Dean Ian Markham told NPR in emailed responses to questions. "For instance, the inscription across the relief is in Akkadian, which is the oldest attested Semitic language and key to ancient Biblical studies ... like any ancient text, it was awe-inspiring for those who studied it." Markham says the remaining reliefs are in temporary storage until the seminary can build a secure display area for them. The seminary has said it would use the funds from the relief's sale for scholarships to increase the diversity of its students. Five other Assyrian reliefs are at Bowdoin College in Maine, where Haskell, the 19th century American missionary who donated them, studied medicine. The provenance of the Assyrian relief provides a glimpse into the freewheeling world of archaeology in the 19th century, when English archaeologist Austen Henry Layard was given permission by the Ottoman sultan to excavate Nimrud and ship off whatever he found to patrons and friends. Haskell, who obtained at least eight of the reliefs sent to the U.S., was a physician and missionary in Mosul in the late 1850s, says Markham. He says it's not known how Haskell knew Layard, but there is documentation that the missionary wrote to a faculty member at his alma mater, Bowdoin College, to ask if they would be interested in the reliefs. The Bowdoin faculty member's brother was teaching at the Virginia Theological Seminary at the time and said the seminary would also be interested. The requirement was that both colleges raise the money for shipping. "Layard did give quite a lot of these to people," says London-based Iraqi archaeologist Lamia al-Gailani. "There was no law — he was allowed to take them and to do whatever he wanted with them. That's how he funded the excavations." Many Christians at the time viewed the discovery of the ruins of Nimrud, known as "Kalhu" in antiquity and "Calah" in the Old Testament, and other Assyrian palaces as proof that Biblical events were real. The June 1858 edition of the Southern Churchman newspaper contains a fundraising appeal for the shipping costs needed to transport the reliefs. Although it refers to artworks from Ninevah, the reference is actually to the Nimrud reliefs, according to the seminary. "We learn that the slabs can be obtained ... through the kindness of a Presbyterian missionary at Mosul, opposite Ninevah, by the payment for the cost of freight, which is $75 a piece, from Ninevah, down the Tigris to Baghdad, Bombay and thence to Boston," the 1858 notice reads. It notes that "most of the Northern Colleges have already obtained slabs." Another Nimrud relief ended up on the wall of a snack shop in a school in Dorset, England. It was sold in 1994 at Christie's in London for 7.7 million British pounds and is now in a museum in Japan. When the American Civil War broke out and the Virginia seminary was used as a hospital for Union troops, the reliefs were removed to a nearby warehouse for safekeeping. It wasn't until the end of the 19th century that the Ottomans put in place an antiquities law, requiring part of the findings be sent to Istanbul to obtain permission for export. Iraq's first antiquities law came into force in 1924. Christie's said it had consulted with law enforcement authorities on the legality of the sale before Tuesday's auction. The auction catalogue noted that the Grand Vizier of the Ottoman Sultan ruling Iraq at the time had given Layard permission to export anything he wished. "Documentation detailed in Christie's sale catalogue clearly establishes the item's provenance, and literature references confirm its consistent presence in Virginia from 1860 forward," it said. But Gailani says there appears to be a lingering question about whether the relief was acquired by Haskell from Layard directly or from someone else after the archaeologist left Iraq. If it were the latter, it's not clear that that the permission from Ottoman authorities to Layard would have applied to that piece. New York's Metropolitan Museum of Art, which later acquired some of the Nimrud reliefs, says Layard left Mesopotamia, present-day Iraq, "for good" in 1851. Christie's says "the frieze was acquired in Mosul in 1859" by Haskell from Layard. "There could be a question mark about it," Gailani says. "There was a possibility it wasn't Layard who gave it to them and the piece was removed several years after Layard left Nimrud." Gailani says while "you can't reverse history," she believes it is still worth protesting the sale. "I'm not sure there will be a chance of getting it back," she says, "but at least it's not just Christie's version we should accept and the Iraqi government should make a little bit of a fuss about it."